Philippa of PHILIPPA’S FARM is an educated, particular, and more than little judgmental woman. The book is more comfortably literary women’s fiction than romance; the main focus is on Philippa’s internal journey and family than her odd romantic options. Over time the circumstances that created our heroine’s current outlook seep out between her inner monologue and low key adventures, which involve encountering a charming author called Gerald, with the reappearance of an old flame as a wild card alternative. Along the way one learns an awful lot about goats, wool, inter-generational alcoholism, and various delicious food stuffs that are described with the love and admiration people normally reserve for their children. 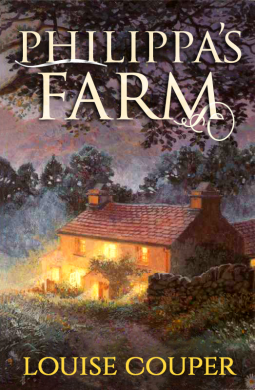 The cover of this book, while very attractive, suggests a cozy novel with cute animals and folksy locals. The blurb suggests a conventional romance—but this is also not delivered. The story within is more acerbic comments, the reality of raising animals for slaughter, and the problem of bonding with nice people when the great majority of people in general are rather horrible. The rustic locals are described more how they probably would be than the usual James Herriot/Darling Buds style of sanitized whimsy. Philippa did grow on me and her anything-but-rose colored observations of courtship in other people and—with equal honesty—herself are engaging in a peculiar way. Part meet cute, part emotional autopsy. But anyone entering this story in the usual ‘cozy’ expectations of an easy read with a ‘nice’ protagonist is going to be very disappointed. By the halfway point I had begun to suspect the point was not getting Philippa, eventually, together with Gerald—but determining whether she really deserved it. Her Asutin-esque cleverness is repeatedly shown as covering profound emotional incompetence which is the engine that feeds her class- , nationality- and gender-stereotype heavy waspishness. The scales have her intellect and emotional needs on one side, and her past trauma and occasional casual cruelty on the other and despite the HEA genre categorization, the outcome does not feel like a foregone conclusion. However also at about the halfway point Philippa starts doing the work and the plot accelerates on a sort of exponential path. Many of the main characters end up on a disastrous overseas vacation which brings out the worst in most of them but gives our protagonist a moment of vulnerability that leads to a very rushed breakthrough on the last page. It might have been less rushed if not for the phrase -- “I’d made a giant f” -- after which the rest of the sentence and maybe a few more is clearly missing at a rather crucial moment. Throughout the book there are also some absent speech marks and spaces suggestion a less than seamless transition from a previous edition to the current one. Overall PHILLIPA’S FARM is a dense and enjoyable book that has to be read on its own terms and repays the investment.